One Tuesday evening 06/29/2015, Monty’s parents noticed that the whites of his eyes appeared yellow. The next day he was admitted to the hospital, and just a few days later, he was officially in acute liver failure. At this point, despite numerous tests, there was no diagnosis. Doctors were hopeful that Monty’s liver inflammation would reverse as spontaneously as it came on, but they also began to conduct all the necessary pre-transplant tests, just in case. Eventually, a test revealed that Monty’s liver had failed due to an autoimmune response — a rare occurrence that affects only 1 in 17 million children. Some children respond to steroids, but Monty’s pain and neurological symptoms, like loss of motor control and confusion, continued to increase. Nine days after he was admitted, Monty’s symptoms necessitated a move to the pediatric intensive care unit (PICU) and he was listed on the top of the transplant list. Monty was in critical condition, his consciousness declining swiftly. Nurses and doctors worked constantly to monitor and maintain his vitals and brain pressure while he waited for a liver. After a little more than two days in the PICU, on 07/12/2015, Monty went in to surgery as a donor liver traveled to meet him there. The transplant surgery went very well! Monty and his family humbled by the gift of his life saving transplant and donor family. Monty’s recovery has been a long and complicated process, and his days continued to be filled with by medical appointments, tests, procedures and therapy. Monty attends an average of 3-5 appointments at Seattle Children’s hospital a week and takes an average of 30 pills a day. 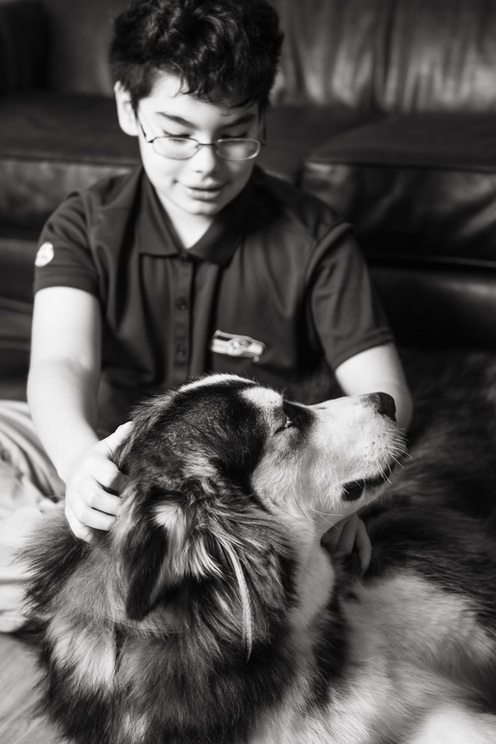 The trauma from his hospital stay was preventing Monty from sleeping, and not although Monty has yet to fully return to school, and he works to adjust to his new normalcy, coping with the emotional strain of critical illness, he has the friendship and companionship of his Giant Alaskan Malamute puppy and the support of his brother and parents, extended family and friends. Medical appointments, test, therapy and overwhelming medical cost, left little room for in Monty and his families lives for family fun. Make-A-Wish came into Monty’s life and provided much needed glimpse of magic. From their colorful brochure in the transplant folder, to the first phone call while Monty was in a coma asking all about Monty childhood favorites, to the surprised Lego themed gifts on the doorstep, Christmas presents and send of party to Monty’s Ultimate Wish- a trip to meet Lego Inventors, Make-A-Wish delivered over and over again a priceless gift to Monty and his entire family, time together to celebrate the fun and joy of childhood.